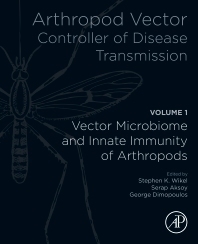 Arthropod Vector: Controller of Disease Transmission, Volume 1: Vector Microbiome and Innate Immunity of Arthropods is built on topics initially raised at a related Keystone Symposium on Arthropod Vectors. Together with the separate, related Volume 2: Vector Saliva-Host Pathogen Interactions, this work presents a logical sequence of topic development that leads to regulatory considerations for advancing these and related concepts for developing novel control measures. The three themes of symbionts, vector immune defenses and arthropod saliva modulation of the host environment are central to the concept of determinants of vector competence that involves all aspects of vector-borne pathogen development within the arthropod that culminates in the successful transmission to the vertebrate host. These three areas are characterized at the present time by rapid achievement of significant, incremental insights, which advances our understanding for a wide variety of arthropod vector species, and this work is the first to extensively integrate these themes. Drosophila—a Useful Model for Vectors? Introduction: Why Target Dengue Virus in Mosquitoes? Dr. Wikel has more than four decades of experience in teaching and research in a variety of areas including Medical and Veterinary Entomology, Biology of Disease Vectors, Immunology, Pathology, and Parasitology. He is recipient of numerous awards and honors including a previous Research Recognition Award of the Southwestern Branch, Entomological Society of America, and more recently, the St. Vincent’s Medical Center Endowed Chair in Medical Sciences. He has served on a variety of panels and review boards related to arthropod vector research, and was co-organizer of a related Keystone Symposium, also facilitating a session on “Immunological consequences of arthropod vector derived salivary factors.” A major focus of his research is characterization of the complex cellular and molecular immunology of the tick-host-pathogen interface as well as the mosquito Aedes aegypti and other insects of medical and veterinary public health importance. His work has been supported by grants from NIH/NIAID, USDA, CDC, and many others. Dr. Aksoy is in her fourth decade of a highly recognized career in academic research and teaching, and a recipient of many awards and honors such as Nominated Fellow, Entomological Society of America, and winner of the Connecticut Technology Council Research, Innovation and Leadership award, both in 2015. She has taught in the areas of Molecular Entomology, Vector Biology, and Biology of Eukaryotic Parasites and Helminths, with a special research focus on biology of the tsetse fly and transmission and control of trypanosomiasis. Together with Dr. Wikel she was one of three scientific organizers of the Keystone Symposium on “The Arthropod Vector: The Controller of Transmission.” She is also an Editorial Board Member for the Elsevier journal Insect Biochemistry and Molecular Biology. In addition to his academic appointments, Dr. Dimopoulos is Director of the Johns Hopkins Malaria Research Institute Parasitology Core Facility. He is a permanent member of the NIH/NIAID Vector Biology Study Section and has lectured in such areas as Medical Entomology, Vector Biology, Innate Immunity and Molecular Entomology. He has been Editorial Board Member for journals including Insect Physiology and Insect Molecular Biology and has authored or co-authored more than 80 peer-reviewed scientific articles. His group’s research focuses on the mosquito Anopheles gambiae, in such areas as defense mechanisms employed by mosquito vectors against human pathogens, and how naturally occurring microbes of the mosquito intestine can influence the mosquito's susceptibility to infection with human pathogens, with an aim to discover control strategies for vector-borne diseases such as malaria and dengue.